Just resurfaced after an extended Alice Days holiday, and had a chance to update my list of Alice movies with several new ones (mostly awful, but one really interesting short art film from the 80s). Check it out (toward the bottom of the page) the next time you need an infusion of Wonderland! Alice in Wonderland playing cards with different quotes and illustrations on each card, making them an ideal impromptu oracular system (which I use during Alice Days)! 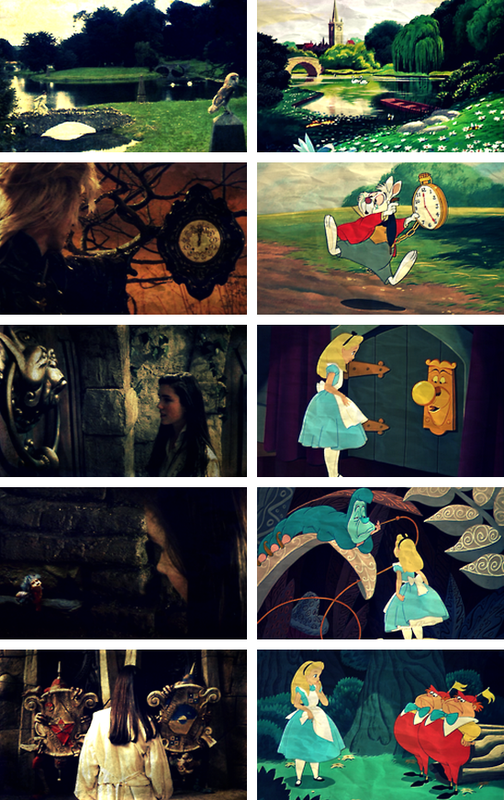 Alice clocks that run backwards! I’ll report back tomorrow on the Burton film. So excited! Not surprisingly, the popularity of Alice in Wonderland, its entrance into the vernacular of modern culture, and the fact that the books are long out of copyright protection, means that there has been a plethora of other Alice stories written by various authors over the years. Here is just a sampling. Alice’s Journey Beyond the Moon by RJ Carter. I read this one many years ago, and it was definitely interesting – it’s presented as if it were a long lost sequel to the original books, complete with annotations, and is full of similar sorts of nonsense, although in my opinion doesn’t really come close to Carroll’s work. Wonderland by Tommy Kovac. This is a Disney-produced graphic novel that ties in (via character design) with the 1950 Disney cartoon. It follows Mary Ann (the character we never meet in the book, the one who the White Rabbit mistakes Alice for) on some adventures through Wonderland, and includes a great, creepy scene with the girls who live at the bottom of the treacle well. The Looking Glass Wars by Frank Beddor. A young adult fantasy novel original enough that it might qualify for its own Girls Underground entry at a future date, but with many references to the characters and themes of Alice in Wonderland. Several sequels as well, although I’ve only read the first book. Fantastic Alice. A collection of Alice-inspired short stories by multiple authors. Some good ones in there, as I recall. There are a few other such collections, including Alice Redux and Alternative Alices, neither of which I’ve read yet. In fact, looking over some of what I’ve found, I realize I have a lot of reading to do! I admit to being more partial to film adaptations than stories, but it looks like there is some great stuff out there. Sitting in my “to read” pile right now are Alice I Have Been by Melanie Benjamin, a novel based on the life of the real Alice Liddell, and Alice in Sunderland by Bryan Talbot, a magnificently complex and strange looking graphic novel I recently picked up at the library.